Home / Militaria, collectibles, insignia, buttons etc. / Other military items. / Hakkapeliitta magazine, vol 1938. Finnish Civil guard. 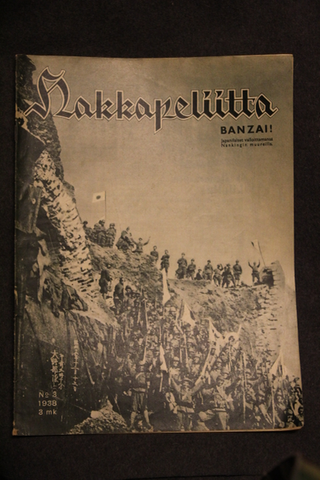 Hakkapeliitta magazines. Finnish Civil guard. Original Civil guard magazines, volume 1938. All are in readable condition, lots of nice pictures, very nice advertisements. Magazine is written in Finnish but some of the pictures and stories are form other countries. 1938 was all about preparations of coming great war, and the Helsinki olympic games of 1940. If multiple issues are available, best is delivered. No: 39 has folded cover page. No: 43 has a small piece missing from front page. No: 44 has a coupon cut of from back cover page. No: 48 has folded pages and some wear.